Oxfordshire Family Support Network (OxFSN). Oxfordshire Family Support Network (OxFSN) is a (very) small charity that provides independent information, advice and support by families for families of people with learning disabilities. Set up by family carers who wanted to use their experience to help others in the same situation we strive to improve the lives of people with learning disabilities and their families. Since Connor’s death we have been beavering away behind the scenes on projects we feel could make a difference to other families’. Today OxFSN, together with Healthwatch Oxfordshire, launch their new report, A Local Experience of National Concern, dedicated to LB’s memory. 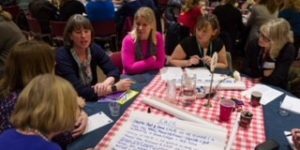 This report, funded by Healthwatch Oxfordshire forms part of a scoping process for further work which we hope will ultimately help other families around the country as well as those closer to home. The report highlights the failures in respect of the current system in Oxfordshire and calls on local commissioners to work with families and people who use services to create services which meet their needs by working with them as ‘experts by experience’. The importance of services and commissioners working with families to seek solutions rather than perceiving families as part of the problem. ‘Our purpose in writing this report was to give a voice to a very hidden group of families, and to show how they struggle with fragile support systems that need to radically change in order that they and their relatives can have a basic quality of life that the rest of us take for granted. Families are isolated and desperate for good support and advice. They often have a poor understanding of the rights of their relatives’.